Mike Garcia, left, parts manager of Hodges Subaru outside Detroit, helps counter employee Shaun McCaw find a component. The dealership’s pay plan gives parts employees a 1 to 2 percent bonus for all parts sales. At Hodges Subaru in the Detroit suburb of Ferndale, Mich., parts department employees get a small spiff in their paychecks: a percentage of the gross profit on the parts they pick from the shelves. That includes not only the parts they sell over the counter and wholesale, but those they deliver to technicians in the dealership's service department. Unlike at many other stores, the counter workers at Hodges are empowered to be flexible on prices. If a customer says he or she can get a part elsewhere, such as on Amazon or eBay, for slightly less, the employee can offer a lower price to make the sale. You might not expect a dealership to give an employee a bonus for retrieving a part and walking it to a tech, or allow a counter worker to have discretion on pricing. But Mike Garcia, Hodges Subaru's parts manager, says the commission and pricing flexibility improve his department's productivity, boost morale and limit employee turnover. He says he also believes these strategies help attract better job applicants. The family-owned store's parts sales through all channels — retail, wholesale and online — usually total $180,000 to $220,000 a month. Such innovations are smart moves, say industry consultants who counsel and train dealers on how to run their fixed operations more efficiently. But they add that fixed ops directors can do more, including in their pay plans, to enable their parts department to boost profits and help technicians work faster and better. Working in the parts department can be one of the least glamorous jobs at a dealership. "The parts department often gets very little attention from the dealer principal." says Greg Dryden, vice president of client optimization at Dealer-FX, a suburban Toronto company that works with dealerships to use digital data to improve customer experiences. "It's a department that just kind of exists." Fixed ops consultants suggest these pay plan elements to encourage parts employees to help boost parts department efficiency and profitability. Reward parts workers for selling old inventory. Hold sales contests, and post each parts employee’s sales on a tote board. Pay parts workers for getting needed parts to service technicians quickly. Incentivize mail-order and online parts sales. Let parts employees offer customers reasonable discounts to make sales. Make sure parts workers know the dealership’s sales goals for parts. Dryden, a former fixed ops director, told Fixed Ops Journal that the parts department is seldom represented in dealership staff meetings, and that parts and service departments often maintain an adversarial relationship. Then there's the pay: Some parts veterans at larger dealerships earn close to six-figure annual salaries. But getting to that level is tough and usually takes years. At many dealerships, parts department trainees often earn barely above minimum wage and are not given a clear career path. A Detroit-area dealership's recent job listing for a parts trainee offered starting pay that ranged from 45 cents to $1.55 more than Michigan's minimum wage of $9.45 an hour. That's not uncommon, says Stacy Toppa, a manager at Automotive Dealer Management Inc., an Ann Arbor, Mich., company that trains dealerships to run their parts departments more efficiently and profitably. "Pay varies greatly across the country," Toppa says, "but even in areas like California that have a high cost of living, their pay is still pretty darn low." Offer incentives to move old inventory: Parts managers shouldn't maintain shelves of slow-moving parts, because that ties up too much capital, Toppa says. Instead, dealers with old inventory should empower parts employees to sell it at a discount. "Motivate your guys to get rid of" old parts, she says. "Give them additional incentives. It's better getting those parts out the door at cost than having to write them off at 100 percent somewhere down the road." Hold sales contests: As part of a flexible pay program, fixed ops directors should run sales contests that enable parts counter employees to earn more money. "Why don't we do contests in service and parts like we do in sales?" Dryden says. "I tell dealers they should have a contest every month. Give them a goal." Reward speedy parts deliveries: Part of a counter worker's paycheck should be based on how fast he or she gets parts to technicians in their bays, Toppa says. "The quicker they get those parts to the technician, the quicker that car can be done and the tech can get another vehicle in the shop," she says. Encourage mail-order and online sales: Activity in most parts departments ebbs and flows. Mornings are often busiest, as techs order parts for the workday, deliveries are made and the parts counter is hectic. 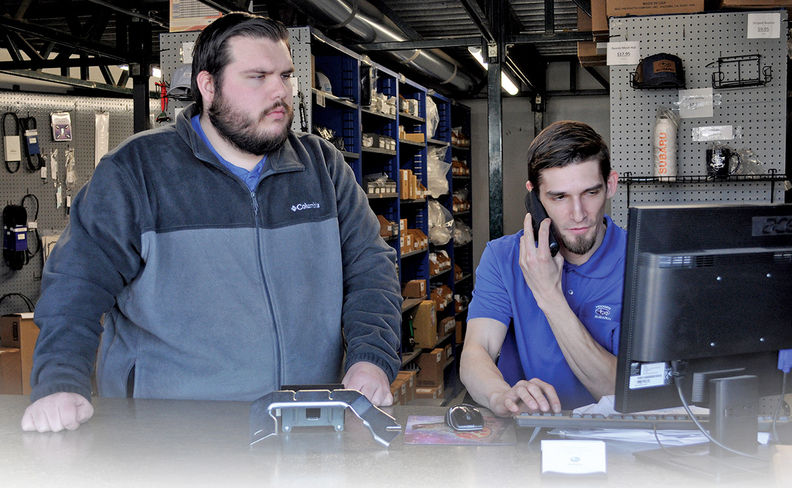 Moving parts sales online can keep the cash registers in the parts department ringing consistently throughout the day. Hodges Subaru recently opened an online parts store (hodgessubaru.com/parts/ estore.htm) that allows customers to shop online and pick up parts at the dealership. Garcia, the parts manager, says that saves time for the customer and the dealership because counter employees can spend less time on the phone quoting prices. Maintain discretion in pricing: Although parts workers should be empowered to offer reasonable discounts to customers, Dryden says, they shouldn't do so unless the customer asks. "One of the ways you can structure parts counter people's pay plans," he says, "is to give them a spiff or a bump based on how much of the gross" profit they preserve. Engage in suggestive selling: If a customer comes to a Ford dealership to buy an oil filter for a Taurus SHO, the counter worker could recommend five quarts of Ford Motorcraft oil. Or the employee could offer a special price to package the filter with a cabin air filter and an engine air filter. Most parts workers aren't trained to do this, Dryden says. Track parts sales on a tote board: "When you walk into the dealership, they've got a board that shows this person sold this many vehicles, and it shows the deals that are pending," Toppa says. "Do that in the parts department, too. "Give the employees a little competition. If they see their number up there, and it is lower than someone else's, they might try a little harder to get their number up. It's more money in their pocket. If the bulk of their pay is tied to commission, you'll work harder for it." Establish sales targets: All parts employees, not just managers, should be aware of the dealership's sales goals for the parts department. "At 90 percent of the dealers in America, if you ask the parts counter guy what their parts goal is for the month, I doubt if they'd even know," Dryden says. As dealerships rely on fixed operations to generate more of their profits, the parts department is expected to contribute to that income. The National Automobile Dealers Association reports that parts sales at U.S. franchised dealerships rose to $68.6 billion last year from $67.5 billion in 2017. Dealers and parts employees must continue to look for new ways to sell parts, Toppa says. "We don't view parts department employees as someone who just stands there and takes orders," she says. "We view them as more of a salesperson, trying to give them that mentality so they can upsell things too. We can't continue to do business like we have for the last 50 years."